Updated Aug. 29, 2015, with a response from the Harris County Flood Control District. We were afraid of this. Big floods are powerful. Anyone who has lived on or spent any time on a river in the wild knows that a river can rearrange its banks with an awesome, even frightening force. Yet floods in nature are necessary. Buffalo Bayou is an 18,000-year-old river, our Mother Bayou. We are privileged to have a forested stretch of the bayou passing through the middle of the city in our great public Memorial Park. But during the Memorial Day flood and the record-high water released by the Army Corps of Engineers from the upstream dams during the days that followed, the rushing bayou took down trees and shrubs in Memorial Park, the Hogg Bird Sanctuary and elsewhere. The bayou was reordering its banks, replenishing and reseeding the floodplain, adjusting to the changing flow, as it has done for a very long time. Downed trees on Buffalo Bayou in the Hogg Bird Sanctuary after the Memorial Day flood. These trees and brush will trap sediment and rebuild the banks. They should be left in place. Photo taken on May 28, 2015 by Jim Olive. Not all of this was erosion exactly. Our geologists explain that some of it was slumping caused by the overflowing of the banks. The overflowing floodwater saturated the high ground and seeped into the internal layers of clay soil that turned to pudding and slid out, creating the concave look that you see on some of the banks. 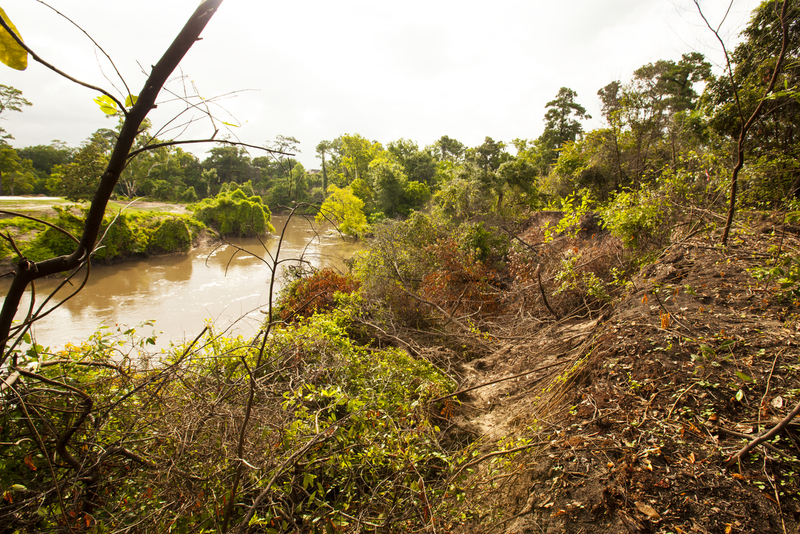 This particular slippery geologic makeup of Buffalo Bayou is one reason why we believe the Harris County Flood Control District’s costly and misguided $6 million “stabilization” project, known as the Memorial Park Demonstration Project, won’t work on the high banks of our untamed Buffalo Bayou, a rare natural asset to have and learn from in the middle of the city. But trees and brush falling onto the banks (and into the water) is part of a natural process, an important natural rebuilding process. The brush collects sediment from the waters of the bayou, building up new banks that the bayou replants with stabilizing and colonizing native vegetation. Yes, amazingly, our muddy, maligned and mistreated living bayou does that, with its own superior intelligence and life force. 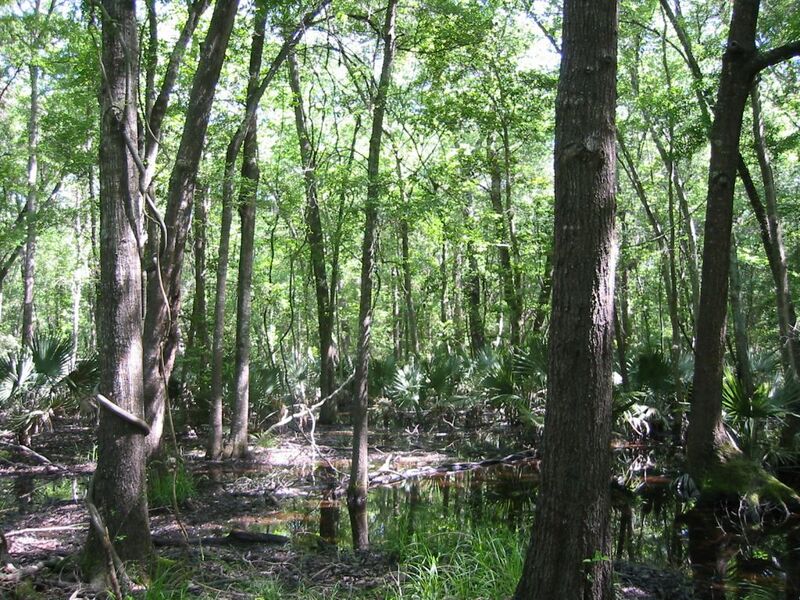 The bayou restores itself, replenishing its important ability to filter pollutants, neutralize bad bacteria, cleanse the water, protect against further erosion and provide aquatic habitat, among many other important functions, including trapping our trash and plastic debris before it ends up in the bay and oceans. For months we watched with suspense the towering piles of concrete riprap. They hung heavily over the edge of a high bank on the south side of Buffalo Bayou near the downstream end of one of the loveliest natural stretches of the bayou in the city. It’s a long stretch of the bayou that the Harris County Flood Control District wants to bulldoze and “restore” to a “more natural state,” so we were apprehensive. A row of small telltale colored flags had first appeared near the waterline here and upstream at the upper limit of the area targeted for flood control’s highly destructive Memorial Park Demonstration Project. The south bank of the nearly 1.5 mile project area is owned by the River Oaks Country Club, which is a one-third partner in the $6 million public project initiated and promoted by the Bayou Preservation Association. The club, which has nearly completed a renovation of its golf course on the bayou, had long threatened to armor its banks with riprap if the “stabilization” project didn’t go through. And now the club has carried through on its threat, laying down black plastic sheeting on the steep banks at those two locations downstream and upstream, distributing chunks of concrete on the slopes, and covering the blocks with dirt. Club member Steve Lindley, who is overseeing the riprap work as well as the golf course upgrade for the club, said that the plastic sheeting is porous and biodegradable and that club plans to seed the dirt with grass to keep it from washing away and eventually to plant it with native vegetation such as chili pequin. 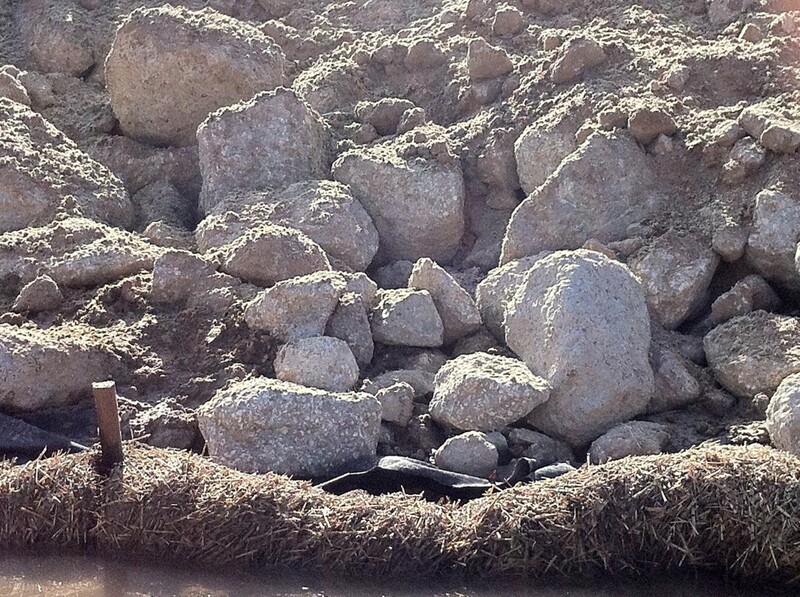 Concrete riprap, dirt, plastic, and straw boom on the south bank of Buffalo Bayou at water’s edge. Photo taken Aug. 9, 2015. The Army Corps of Engineers is not keeping track of whether developers are replacing tens of thousands of acres of wetlands lost to development in the Houston region as required by law. Under the federal Clean Water Act, the Corps of Engineers is charged with protecting our wetlands. Wetland photo by John Jacob, director of Texas A&M University’s Coastal Watershed Program, published in the Houston Chronicle, July 31, 2015. Printed with permission of John Jacob.